A rare high horsepower combo here in Raleigh. 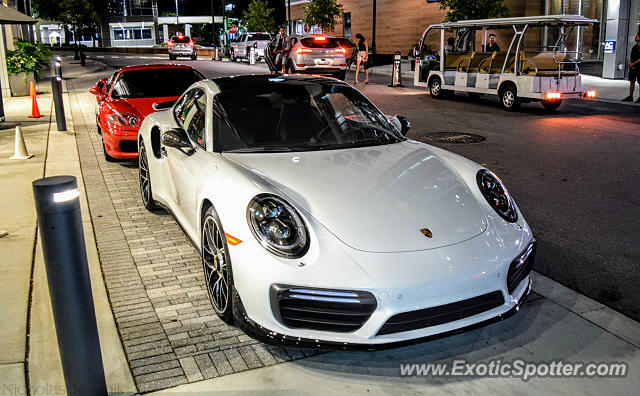 991.2 Turbo S and a gated 360 Modena at The Capital Grill at North Hills a couple weeks ago. I saw a white SV in Charlotte last year, which was from Lamborghini Carolinas in Greensboro. I wonder if it was that one? Sweet, that's the first I've heard of an SV in Raleigh. Any idea if it's a local car? It's also white but has orange calipers instead of the white ones on the Glenwood one. And an SV??? Where??? What color??? It's hit or miss, but I've caught some decent cars there recently. I had to get my exhaust system looked at nearby on Wednesday so I drove through around lunchtime and only saw a (probably different) 991.2 Turbo S, but I've seen several Bentleys, Maseratis, Rolls-Royces, i8s, R8s, and the like driving around there, as well as a 4C and some other cool stuff like that. I was talking with someone on Reddit a couple days ago who lives in a neighborhood there, and he said his neighbors own an Aventador Roadster, new R8 V10 Plus, numerous new rare Bentleys and Porsches, and a bunch of Ferraris. Dang dude I have to go to north hills one of these days! Yep you got that right haha. If this was a GT3 I'd probably take it over the 360, but Turbo/Ss are pretty boring imo. Well, boring for 500+ hp cars lol. The Ferrari did have those twin five spoke F430 wheels painted black, which didn't look terribly great, but I hadn't seen a 360 in like three years so I really didn't care what it looked like. Usually I'd prefer the gated manual car too, but if the Porsche were in a different color I'd actually go with the Turbo.